Birding Is Fun! : How Old Is That Eagle? Where I live we're about 3 weeks away from the arrival of the first of the spring migrants (usually Say's Phoebe), so I was faced with the dilemma of what to write about this month. The answer came after seeing several posts on list-serves I follow where posters were asking the age of the Bald Eagle they had photographed. 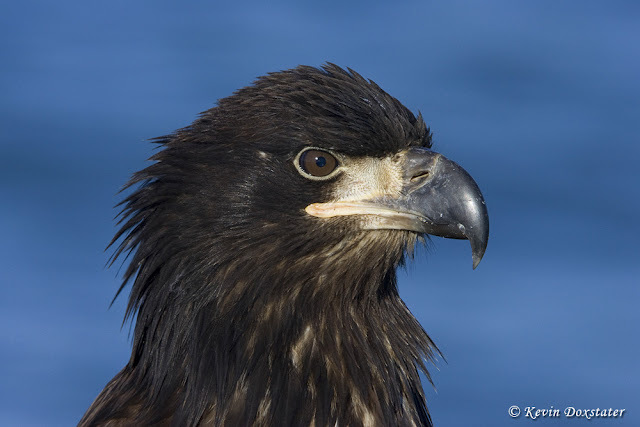 So for this month I bring you Kevin's guide to aging Bald Eagles . . . Most sources describe plumages as juvenile, 2nd year, 3rd year, 4th year, and adult. However, another source I've read actually describes 6 different plumage variation: juvenal (sic), basic I - IV, and definitive (same as adult). I think we'll stick with the first method here, since that is the most commonly used method. It's probably important to talk a little about molt, as different bird families can very have different molt cycles. Ducks, for example, molt twice per year with each molt taking two to three weeks to complete (and they actually become flightless for a short time as new wing feathers grow). Many others molt twice per year, but don't lose they ability to fly, though they may not fly as well until the molt is complete (classic examples in plumage variation that present challenging ID's are the warblers). 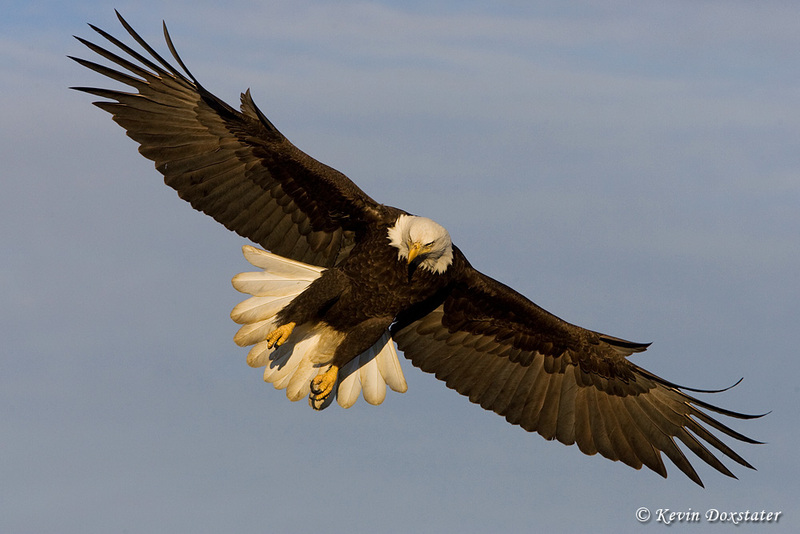 Bald Eagles molt once per year, however, the process is spread out up to 6 months. Growing new feathers requires a lot of energy, so spreading the replacement of over 7,000 feathers out over time has its advantages for a large bird - that works out to about 40 new feathers per day. Have you ever seen a Bald Eagle (or other raptors) missing wing feathers and thought to yourself "that poor bird is missing a/some feather(s)"? Though it/they may have been lost in a fight, the bird was probably just molting. This first photo is a close-up of a juvenile bird, though at about 6 months of age is starting to show signs of molting to 2nd year plumage. As you can see there's some white mottling showing, but in full juvenile plumage the feathers would all be dark brown. Note the dark gray bill, the flesh-colored cere (fleshy area at the base of the bill), and brown iris. In the second year the white mottling is quite extensive on the body and wings.This mottling is also highly variable, some birds spotty while others can be almost completely white, especially on the chest and belly. The bill remains dark, as does the eye. Many will begin to show a little more yellow as they get older in the ceres. By year 3 they are starting to take on some of the traits that we'll see in adult birds. The eye, beak, and cere are starting to turn yellow, while the head and tail are becoming whiter as the body feathers lose their mottling with white feathers replacing brown. By year four the eagles are really starting to take on the look of a sexually mature adult. There can still be a little white mottling in the body and wing feathers, the beak, eyes, and cere are nice and yellow. The biggest thing is the "dirty" look to the head and tail feathers as a few brown feathers remain. One more year and they can start looking for a mate! 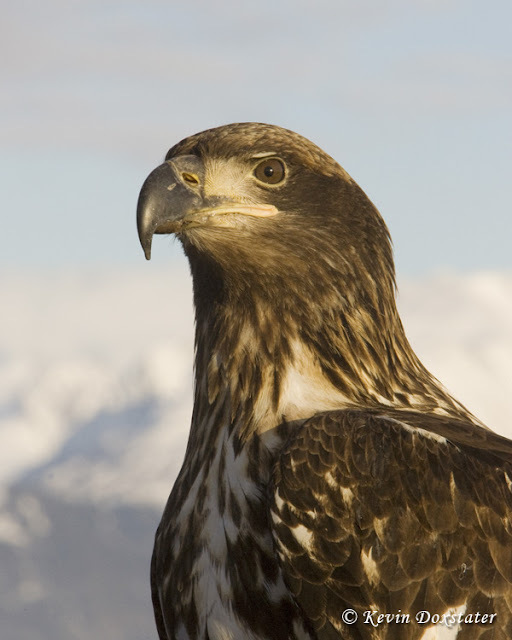 By adulthood the head and tail are all white, the body feathers nice and brown (notice how most of the feathers on the calling eagle have worn tips that look light brown), while the eyes, bill, and cere are yellow. 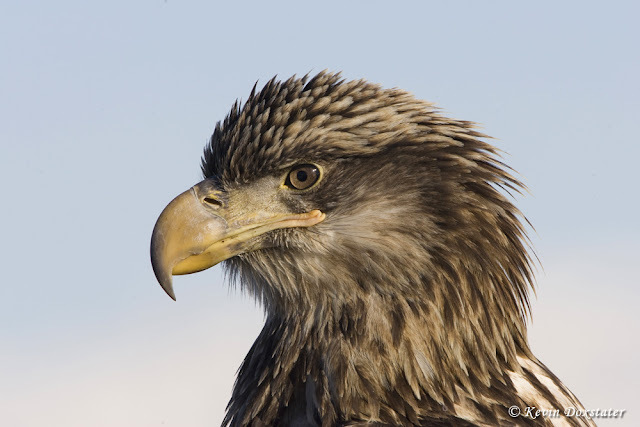 It can be tricky sometimes, too, when an adult has a dirty head or tail and may look a little like a 4th year eagle - look for body or wing mottling to be sure. 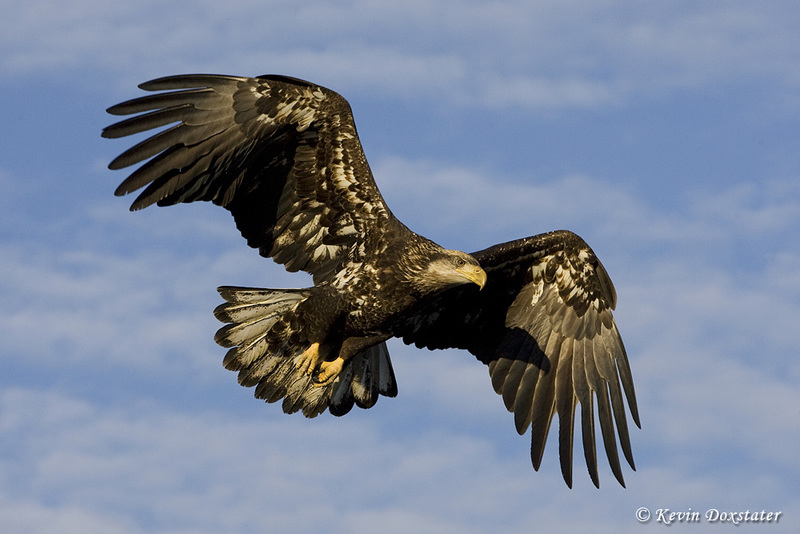 In closing, I also would like to point out that, to be technically correct, in Bald Eagles the term juvenile is used to describe birds that are in their first plumage cycle; "Immature" is the term used for cycles 2 through 4. Have a fun month birding and, hopefully, by this time next month I'll be seeing the first spring migrants here in southern Utah . . . I wish I saw enough eagles to need this terrific info! We do have bald eagles right outside NYC, where I live, and they have been spotted in past years right off the west side of Manhattan on ice floes in the Hudson River. But I've only seen them when I travel to New England or the Pacific Northwest. Kevin, you have wonderful photos, and the post is a great guide to aging Eagles. With your pictures it is much easier to remember. this helps me out a lot. thanks for the info. 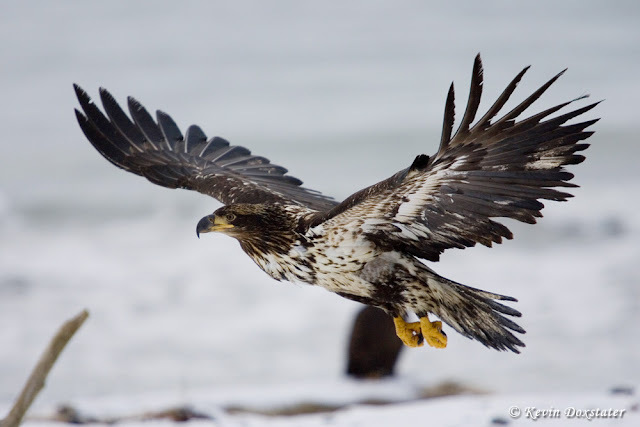 Great post and shots of the eagles. Outstanding post and gorgeous photos. Very helpful information, and the photos are a total WOW! Terrific post, Kevin. Great information and photos. This is one for the bookmarks! Wonderful photos and info Kevin! Outstanding photos and information Kevin! I am going to share this on our Wildcat Bluff Facebook account for our contacts on the Texas High Plains. Fantastic post and photos Kevin! I've been seeing juvenile bald eagles all winter, and now have a superb reference guide to follow. Thank you for posting this! Great information, and those photos! Amazing. Excellent post and really informative. Great information Kevin. The photos are incredible! Very very well done Kevin. 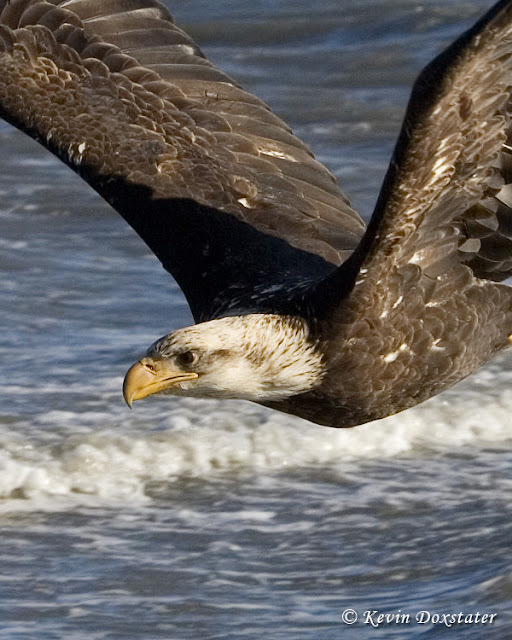 Beautiful Bald Eagle images and a very nice explanation of aging them. Great information! Spectacular photographs! All make for an outstanding post! 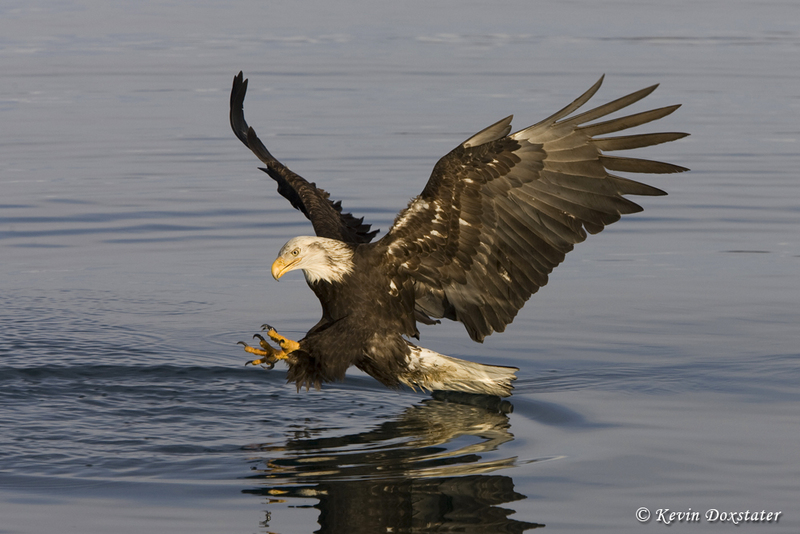 Fantastic images, and a very clear presentation of the ages of Bald Eagles. Great post. Thanks very much to each of you - I really appreciate your kind comments! Great post! A lot of very useful info! I think I need to go back to my Flickr post from earlier today & change from "juvenile" to "immature"! Great photos, Kevin! Please let us know if we might use these (with your copyright/credit line, of course) for (free & open to public) raptors workshop in NY state. Thanks even for considering! This is so helpful! 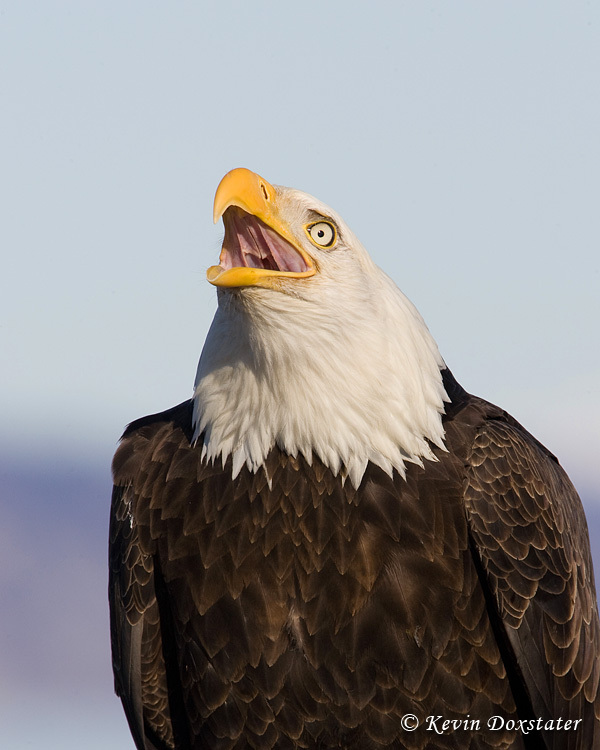 I've never seen an eagle before but I saw one outside my office the other day (almost completely positive it was a bald eagle - I saw a completely white tail) and I saw a different one today (imagine my excitement - I've always loved these guys but never seen one!). The second one looks like a 3 year old bald eagle, but I was having so much trouble telling the difference between a juvenile bald eagle and a golden eagle. This guide was great!